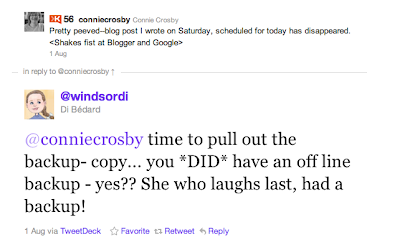 Connie Crosby: Blogger Monday: When should you back up your blog content? Blogger Monday: When should you back up your blog content? 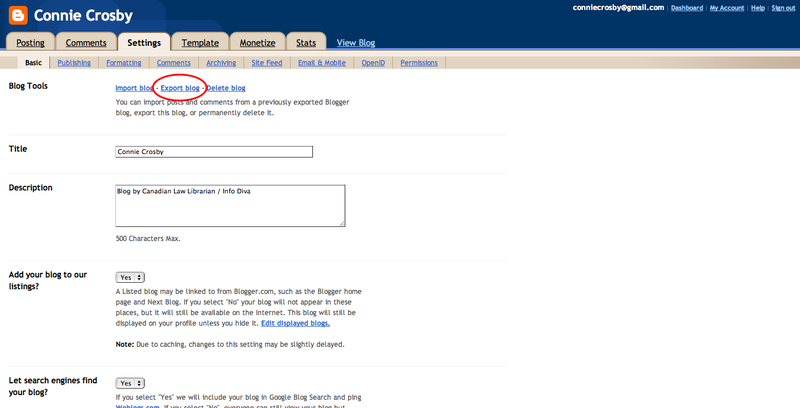 Last week I wrote my "Blogger Monday" blog post Sunday night and used the option to schedule it to post on the Monday. I went to sleep, content in having a new blog post under my belt. I have been on Blogger, Google's blogging platform, before it was even owned by Google. Yes, more than seven years. 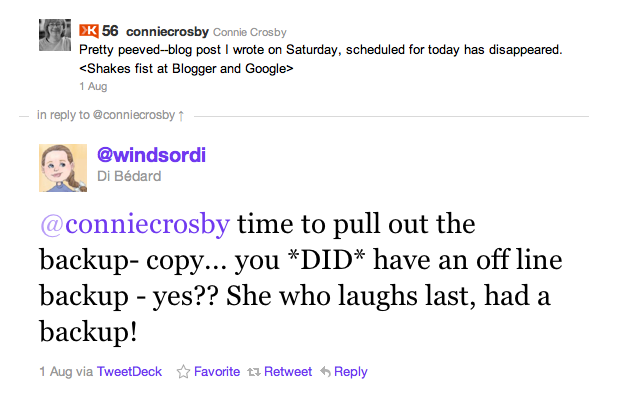 I have always composed my messages directly into the blog, hit "publish" and never had a problem. Until last week. The next day I went about my day, and it wasn't until late morning that I thought to check in to the blog. Much to my surprise, the new blog post was not there! I went into the dashboard on the back end. Perhaps I had done something wrong? With the WordPress blogging platform, for example, if you leave the category "uncategorized" checked off, the post does not appear publicly. No, nothing there. I checked draft posts, I checked scheduled posts, and I checked all posts. Nothing. I tried searching the posts from the back end, again nothing. I spent a couple of stressed hours. I remembered largely what I had written, but who wants to spend another hour rewriting a blog post? I checked Google's help forum and discovered a few others had experienced the same problem recently, but no one was offering answers as to why and how to recover. I vented a bit on Twitter, and got a bit of sympathy but again no real answers. Backup? Ummm...hrm. I had never thought to back up an individual blog post. I always thought once it was accepted as post I would be safe. Apparently not! My first reaction was to say "I could never write off-line and then post to a blog! 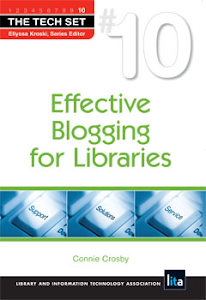 Blogging directly into the blog platform is part of my creative process!". I have to admit to being a bit huffy about it. And then I realized that (as is always the case) Di was right. Go to the HTML editor for the blog post and copy all content (using "select all" in the browser). This way I capture all the HTML coding. I then copy it into a text editor rather than Word so that extra Word code is not added to the document. And...save. If I need to reinstate the blog post later, I would copy from the text editor document, and paste into the HTML editor screen. So how did I get the post back last Monday? After putting it aside for a couple of hours, I came up with an idea: what about my browser history, was there a link there? I went in, and was very fortunate to somehow (mysteriously) be able to pull open the blog post. It appeared to somehow still be in Blogger, albeit lost. I copied from the HTML editor and then went to the blog in a fresh screen, started a new blog post, and pasted the copied text back into the HTML editor. I was extremely lucky all of this actually worked. In addition to backing up individual posts, what else should you do to back up your blog content? It is a good idea to periodically back up your content in case the site goes down or disappears. Think about the format you are exporting the content into. What about the blog template, especially if you have customized it? 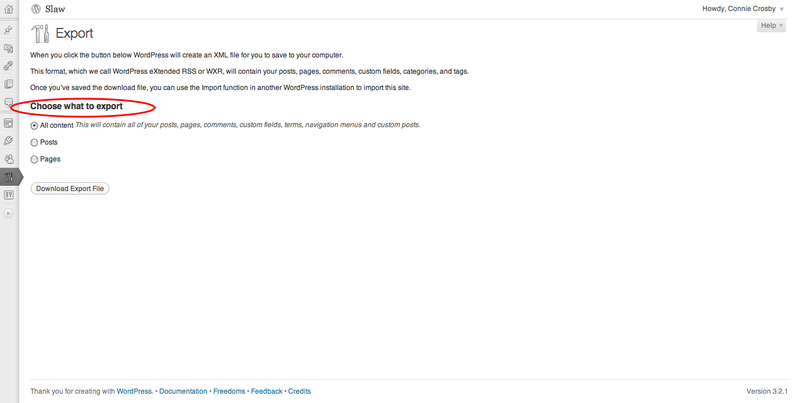 On Blogger it doesn't hurt to grab the template HTML (copy from the Template > Edit Template page). 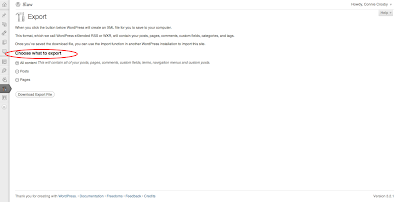 In WordPress, keep track of the plugins you have added. What about blogger profiles? And other pages added such as with WordPress? Will the content you capture allow you to sufficiently replicate the blog later? Move to another platform? Where will you store the backup versions of the site? Think about the measures you typically take to back up important content. You may wish to do the same with your blog content. How often will you back up content? It is a good idea to stick to a regular schedule. Will you back it up daily, weekly or monthly? Who will be in charge of backing up the site? Who will fill in if that person is away? I have to admit being a bit cavalier with my own blog, but after last week's incident am starting to realize how much personal equity I have built up in this blog and how I should be making a more concerted effort to back it up. And of course if you are administrating a blog for work or business purposes, you may have even more important reasons to back it up consistently. Finally, it is a very good idea to have a separate development or test site for making changes to the blog template or plug-ins. Set up a copy of your blog at a separate URL to test out changes. That way if you mess something up, you haven't destroyed your good work on the main site. This is something I see others doing. In the past I would have just tweaked the template of this blog on the fly; however, especially with something like WordPress, code and plug-ins can interact in unexpected ways. As I start to think about changing the template to this blog, I am giving thought to setting up a separate test site so I can play around with options and not risk losing my hard work. Some months back I lost a whole website because I didn't have a back up. Never rerally found out what happened to it but it disappeared. My hosting company didn't have it backed up either! That taught me a lesson! Fortunately for me it was a site I wasn't too bothered about. It recreates the entire structure for you on the location of your choice. I chose my hard drive.